An interesting fact about the Hebrew in which this Scripture was orignially written is that the word “fitly” is actually the word for chariot wheels. It therefore speaks about words being the things upon which other things move forward. When Solomon wrote this Proverb, perhaps he was aware that words have power to motivate and to put events in motion. Maybe for you, the time is now to put in motion the dream of your lives, to join each other in holy matrimony. The word fitly spoken in this case would be “I do.” And what better way to seal your promise to each other than with this 14k solid yellow gold wedding band with Proverbs 25:11 inscribed inside? Not only is the Scripture memorialized, but two “apples of gold” are engraved in a lovely textured square that represent the words of your vows spoken before God and man! Part of our special collection of Christian Wedding Bands. Beautiful words that gently lead are those words that a listening ear loves to hear. In the marriage union, these considerate words are those that a loving husband and devoted wife speak to each other. 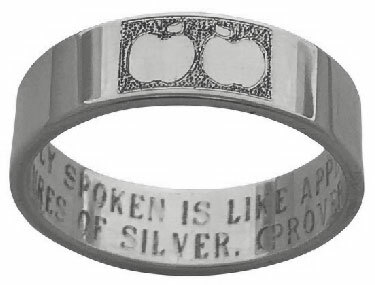 You can be reminded of those kinds of words every day if you wear this unique 14k white gold wedding band that boasts two delectable apples on the top of the ring and the words of Proverbs 25:11 inside the ring. Of course, you don’t have to get married to wear this constant reminder of godly communication! It works just great as a stand-alone ring on either hand! See even more ideas in our Personalized Wedding Rings collection! How much the Bible has to say about communication! Of course, the most complete, most beautiful, most necessary communication of all was God’s statement that “whosoever believeth” in His Son would be saved (John 3:16). 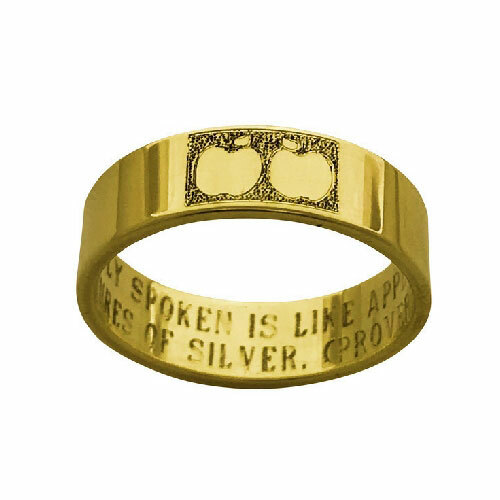 Perhaps, rather than as a wedding ring, you might use this beautiful band as a promise ring or a simple way to remind you to share your faith with “words fitly spoken,” as Proverbs 25:11 (engraved inside) says. With you choice of yellow gold, white gold, or sterling silver, one is sure to fit right in with your jewelry wardrobe in a special way! We have many more delightful ways to share your faith in our collection of Silver Religious Jewelry!